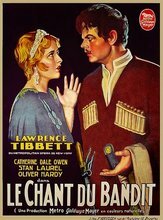 Princess Vera falls in love with the bandit Yegor, who later kills her brother-in-law, disrupting the romance. Yegor kidnaps Vera, but then he is captured by soldiers. This film is largely lost: only two sequences from this film still exist, plus the soundtrack and 8 production still photographs. For his performance Lawrence Tibbett received an Oscar nomination for Best Actor.